We left CR around 9:30 AM CST and were checked into our room by 2:30 EST. We had a snack and changed for the pool. We took some laps around the lazy river, swam in the heated pool, and walked the grounds to orient ourselves. Feeling hungry after skipping lunch, we took the advice of the front desk staff and followed the mile-ish garden path to City Walk. 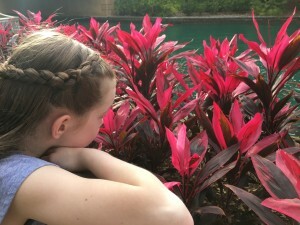 Emma loved the flora and fauna; she was tickled to see that there was a different variety of iris that bloomed in Florida, saw several little lizards scramble along the path, and exclaimed over and over how “amazing” everything was. She also maintained that she was not overusing the word amazing as she so often does at home. 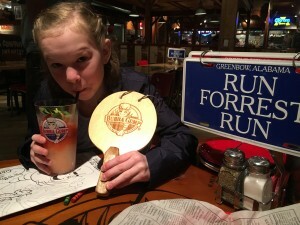 Emma picked Bubba Gump’s from the list of City Walk restaurants. She didn’t even want to read the rest of the menu after she saw clam chowder on the first page. I ordered her a side of garlic bread, also, because she really had not eaten all day. She also picked some sort of frozen concoction that came in a souvenir cup and made her feel really special. Our waitress came over after our food was delivered (and mostly devoured) and asked if we would like to do some trivia; she asked SpongeBob questions to Emma and Forest Gump questions to me. I only missed the brand of running shoes – I went with New Balance instead of Nike. Our conversation took us to the topic of Emma’s birthday trip; she soon gathered her coworkers and an ice cream sundae to sing a special birthday song for Emma. The walk back to the hotel was a little slower with Emma in a semi-food coma state. When we arrived back to our hotel, we walked through the gift shop so Emma could see what souvenirs would be available onsite instead of purchasing at the park. We combined our efforts to earn some tickets in the hotel arcade, and then turned in for the evening.